on’t you just hate it when you’re just relaxing at home after a hard day’s work, want a beer, and you can’t find the bottle opener? Unsurprisingly, when you actually need it, the sucker cannot be found. It’s okay if you’ve got screw tops. However, this won’t work if you’ve got traditional bottles to open. You’re angry and no longer relaxed, and who can blame you? This is why you need to invest in a different kind of bottle opener. A wall mounted bottle opener, to be exact. Yes, we mean one like the kind you’d see in an old Irish pub. We hear your concerns. You’re worried a wall mounted bottle opener might be a little too bulky for your studio apartment. However, modern wall mounted bottle openers don’t have to be big unsophisticated clunks of steel or iron. They’re actually a lot more refined these days and are designed to fit in with a home environment. Think about your life without such a bottle opener. What do you do in those precious, needed, bottle opening moments? If you’re like us, you just get another portable, easy to lose bottle opener. Then the same thing happens yet again. More money is thrown away with nothing to show for it. This vicious circle that will undoubtedly result in you finding a ridiculous amount of bottle openers all over your place. However, all of this could have been resolved beforehand. That’s why the wall mounted bottle openers we’re going to look at in this post are so crucial for you. They solve problems BEFORE they happen. However, we cannot be in too big of a rush. There are some questions we need to answer first. Obviously, one of the main benefits of wall mounted bottle openers is that you can’t possibly lose it. Not as long as it’s fixed to a wall in your house, where it should be. Perhaps, you’ve got an elf who likes to steal bottle openers, even those fixed firmly to the wall. Usually, it will always be exactly where it was the last time you used it. Even someone new to your house, such as guests at your get-togethers, will have no trouble finding it. Another great benefit of wall mounted bottle openers is really on display during parties. If you’ve been using handheld, portable bottle openers up until now, you’ll know how frustrating it can be. Such as at a party when one guest hogs the bottle opener or doesn’t put it back where it should go. The kitchen usually ends up overcrowded due to this. However, when you have wall mounted bottle openers, you avoid the lines that back up from the kitchen all the way up the hall and into the bedroom. It will always be in the same place. A quick flowing line can form behind your super-cool bottle opener and keep those beers flowing freely. The final benefit worth noting is the fact that a wall mounted bottle opener looks incredibly cool. Even if you’re not getting it for your bar and even if you don’t have a bar at home, a bottle opener of this kind will look awesome. Particularly as they now come in a wide variety of different designs with lots of famous brands getting in on the fun. 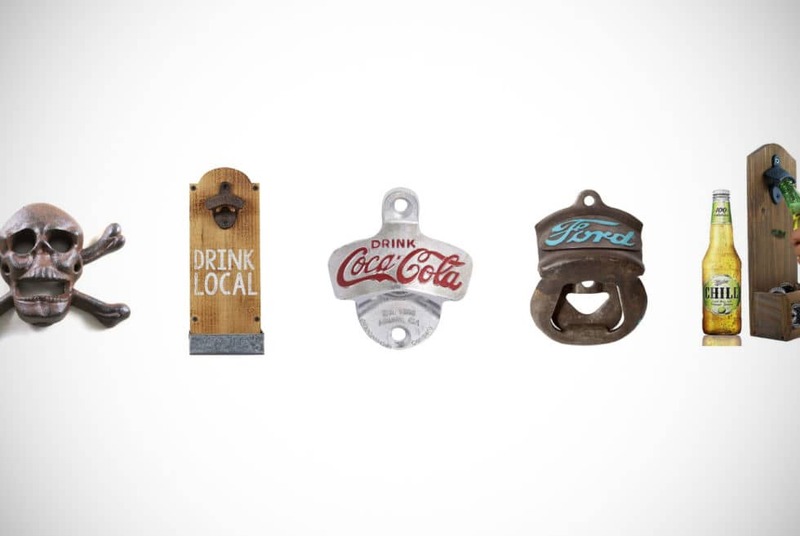 Ford, Coca-Cola and many more have their own wall mounted bottle opener to add fun to any home. Will a Wall Mounted Bottle Opener Damage My Wall? This is a common concern for many people and with good reason. After all, you’re fixing a piece of metal to your wall that’s going to undergo pressure each time you, one of your household, or a guest fancies a bottled beverage. It’s at least possible that over time it could cause problems and damage your wall. Especially as many people using it at some point will be slightly inebriated, to say the least. However, that misconception is not really true though. Good quality wall mounted bottle openers should be able to handle whatever you throw at it, or open with it. As long as you’re not going at it like a bull in a china shop, that is. These are designed to stay put and withstand the pressure. Therefore, one of the most likely reasons for wall mounted bottle openers causing damage to your wall is that it was not installed it properly. The proper installation makes this far less common. Rather than being the bottle opener’s fault, it might be your own fault. There’s one other reason why that bottle opener mounted to the wall could cause damage to the surface. Not all bottle openers, wall mounted or otherwise, are made equally. If you invest in a wall mounted bottle opener that’s made from inferior or less than sturdy and robust materials, it may not stay attached to the wall for very long. Worst still, it could take a chunk out of your wall. That is even if the bottle opener itself is made with high-quality materials. What are Wall Mounted Bottle Openers Usually Made of? Finally, we arrive at our last question and it’s an understandable one. What the wall mounted bottle openers are made out of often seems to be the question on the minds of people around the world. The materials used greatly impact whether or not a wall mounted bottle opener will stay in place and last. Most bottle openers on this list are made from cast iron. That really is the classic bottle opener material. However, there are other materials used too such as stainless steel, die-cast metal, and commonly aluminum alloy. That’s just the opener themselves though. Some come attached to a plaque backing and those tend to be made from a lightweight but robust wood, with a classy finish. Now that we’ve addressed the burning questions regarding wall mounted bottle openers, it’s time to dive right in and look at the products our team here at Men’s Gear have chosen. First on our list is this great set of 12 wall mounted bottle openers. 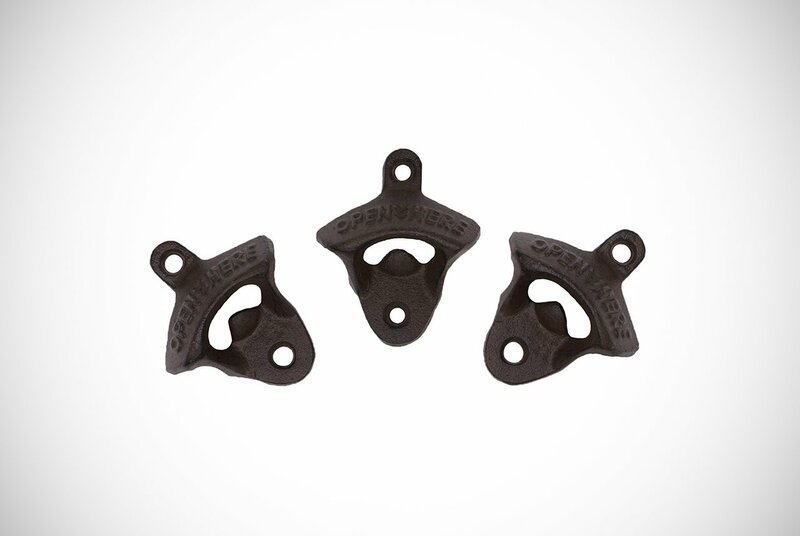 Produced by Dsmile, these bottle openers are made from robust cast iron and have a very vintage look. If you’re looking for that classic style – picture an old pub or dive bar and you’re there. Thanks to the cast iron used to construct it, it’s much more robust than the average carabiner, flip-flop or keychain bottle opener you may use normally. This model is also incredibly simple to install. You’re given 24 1/2-inch black aluminum wooden screws to allow you to mount the opener anywhere you wish. When it comes to using it though, it’s when it really comes into its own. It can quickly remove the cap of most regular beers, sodas and other bottles you may have. 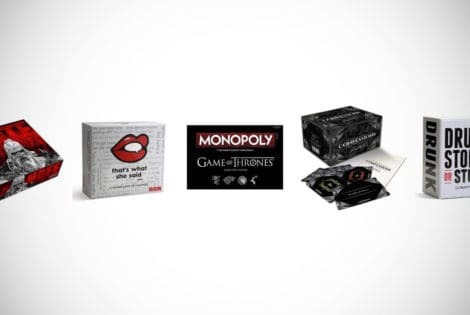 The fact that you get a 12 pack of these things is one of the biggest selling points – a freebie for the guys? The next great wall mounted bottle openers on our list is this rustic farmhouse styled (faux) cast iron set of 3 from iGraver. Another robust accessory, these are made to last and can be mounted on virtually any wall throughout your home. It will give your home an old traditional sort of charm. Even though its faux cast iron, you wouldn’t notice the difference because it’s incredibly durable and strong. 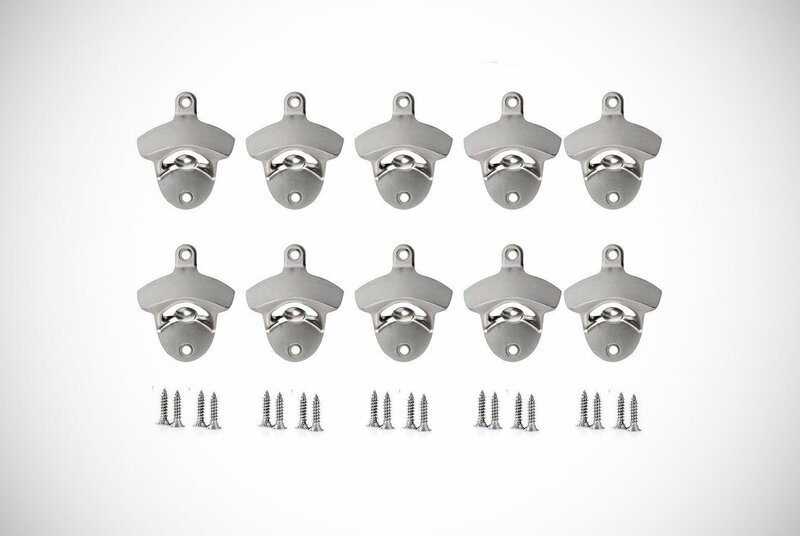 Like many on this list, it’s very easy to install and comes with the appropriate screws you need, so you don’t have to go down to the hardware store to try and size up the right fixings. If you’re looking for a sturdy and eye-catching solution to opening your bottles, this may be it. 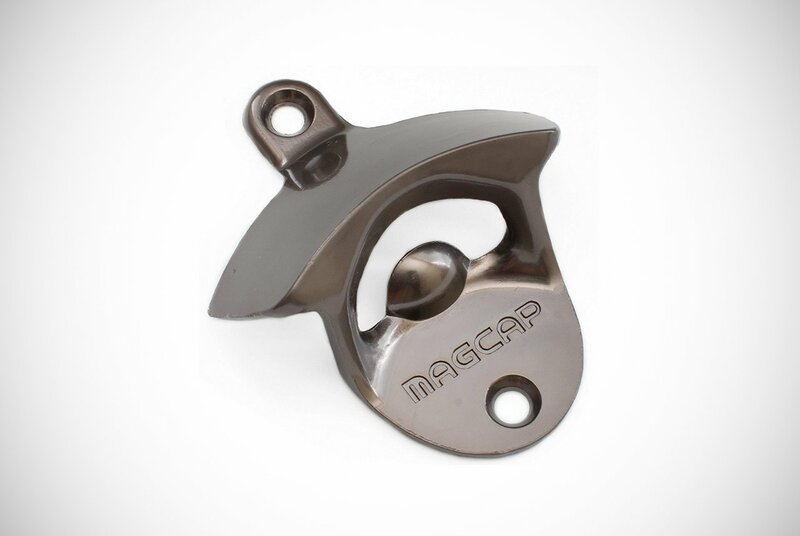 The next cool bottle opener opening our list is this great looking, sturdy number from MAGCAP. 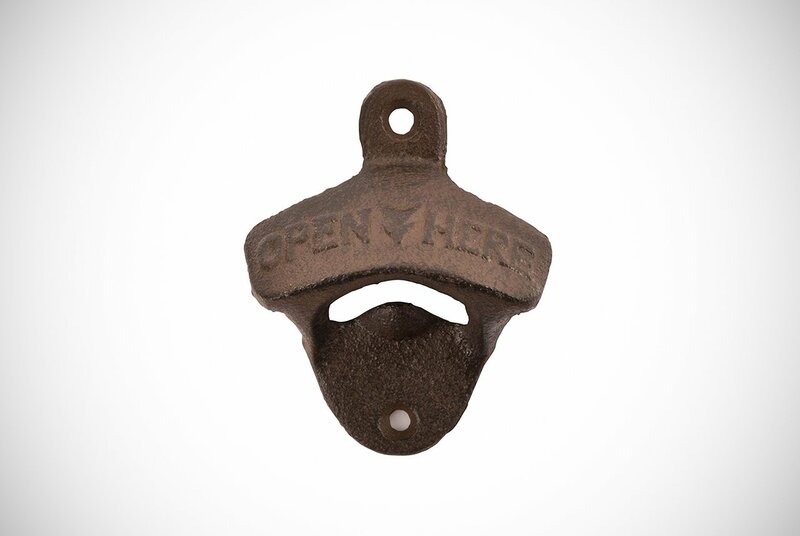 Although it looks like any other bottle opener, remember that looks can be deceiving. As well as opening your bottles, this will also catch the caps before they hit the floor. It’s designed and built with two powerful neodymium magnets that pull the caps in once you remove them. Well, that’s what should happen in theory anyway. Your friends and guests will be fascinated by it, the first time they see it in action. 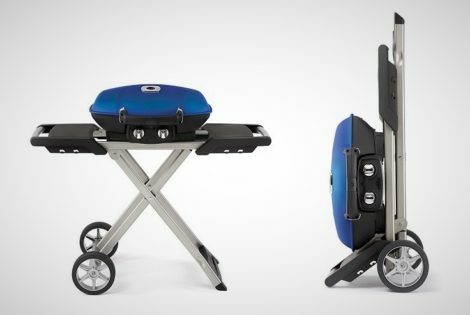 Not only does it have a practical use, it has the fun factor too. It will last a long time too as it’s made from a sturdy zinc alloy. From 30 Watt, the next wall mounted bottle openers are an incredibly funny model with a whole lot of attitude. Even if you don’t agree quite with the wording, who could argue with the sentiment of forgetting whatever’s on your mind and having a few cold ones? 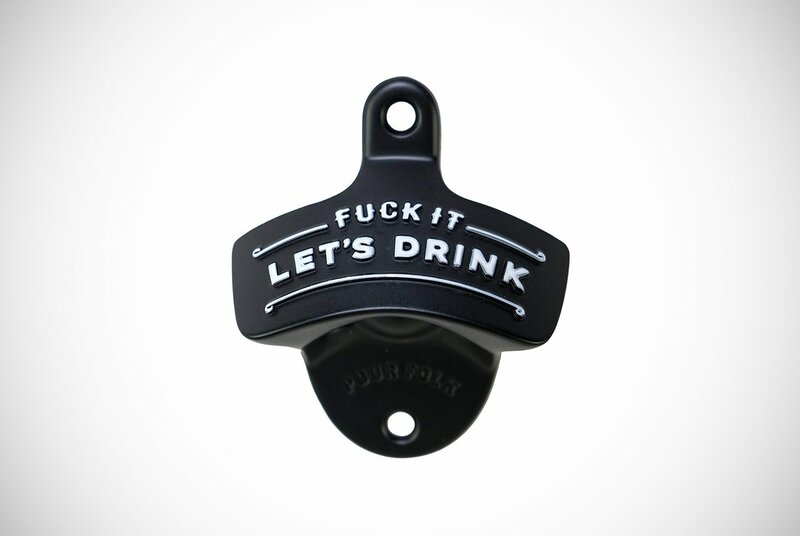 The opener is emblazoned with the pointed phrase of “F**k It Let’s Drink.” It is perfect if you have a good sense of humor or are buying it for someone that does. The claim is, as is with most, that you can open a bottle using this with one hand. That leaves you able to get a cold one ready for drinking. All while shrugging your shoulders and lifting one hand in anger as your team loses the ball once more. Made from zinc alloy, you know this will be incredibly robust and durable. A great design, even if it’s not for everyone. Sometimes all you want is a sturdy and durable solution to bottle opening. Sometimes you don’t want a bear’s head or some branded logo on your wall, you just want an effective and reliable device for cracking those cold ones. 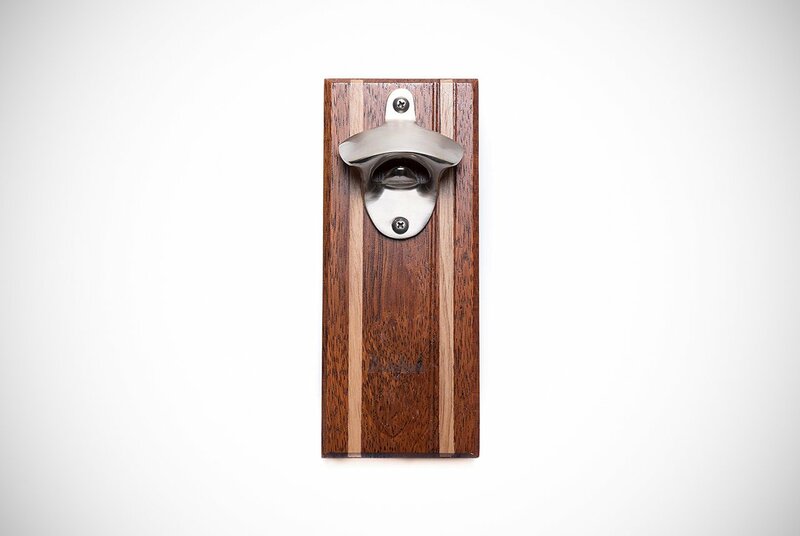 Zramo simply makes the straightforward wall mounted bottle openers we all want. Its simple design includes the words ‘Open Here’ with arrows pointing you in the right direction. In a classic vintage style gunmetal black, this strong alloy is a slick customer. Slick, doesn’t need fancy logos or designs – it gets the job done. As is mostly standard with these bottle openers, you get the screws to fix it to the wall. A good choice too considering the extremely affordable price that gets you a pair of these. Perhaps you’re after something simple, elegant even, but reliable and sturdy. 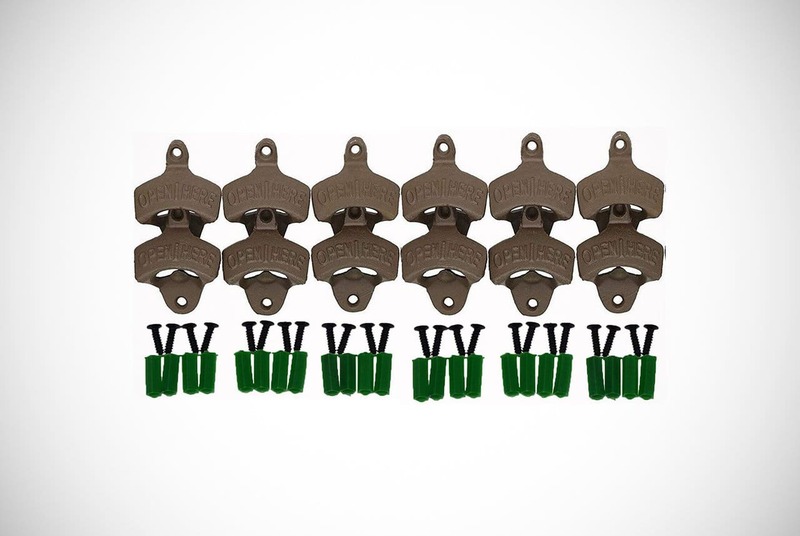 You may want to consider the Alued pack of 10 wall mounted bottle openers. These have a very small and compact, but reliable construction. Made from zinc and brushed with chrome silver, they’re eye-catching despite their size. They’re also easy to personalize, if you need to or want to. Considering the low price point, it’s amazing that you get so many, and the screws required for installation too. A massive bargain. From the compact and discreet to the loud and proud, the next batch of wall mounted bottle openers are from the aptly named Caplord. This is an incredibly strong accessory, fashioned from stainless steel for that promise of a long lifespan. It also means it’s suitable for outdoor use as well as indoor. 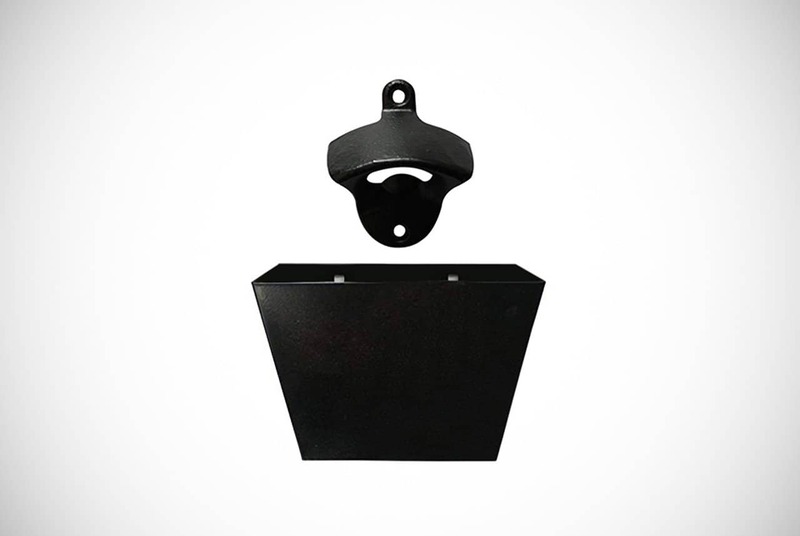 What makes this a particularly good catch is the magnetic cap catcher that comes with it. 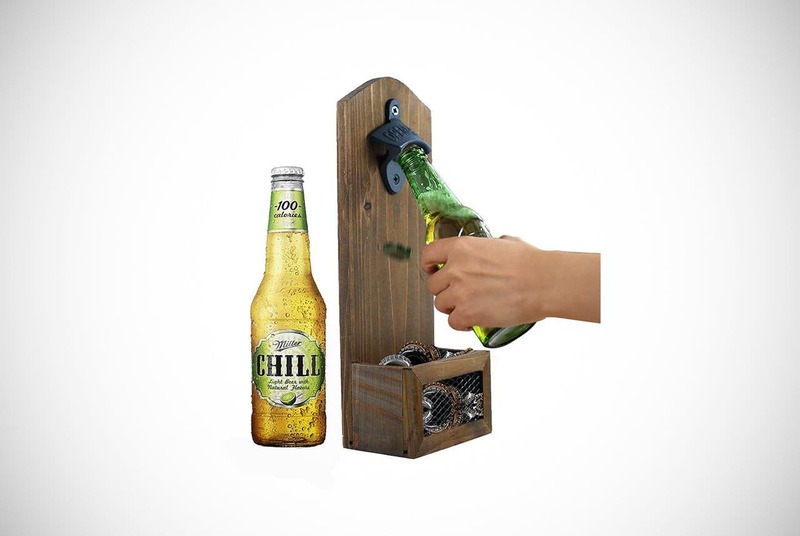 The makers claim it can hold up to 40 bottle caps at any one time, thanks to the neodymium magnets. Even comes complete in its own special, and kinda hilarious, gift box. Rather than just having a little ledge to catch those pesky caps, don’t you just wish one of these would have a proper bucket or container? Well, look no further than the Belle Vous bottle opener if that’s what you’re after. This comes with its own cap catcher that can hold up to 75 caps at one time. Thanks to the fact both catcher and opener are made from a black matte-finish stainless steel, they’re both suitable for use just about anywhere. Perhaps, you want to give your garage an attractive and practical solution to opening those cold ones of yours. Maybe you want to put it somewhere else. Regardless of where wall mounted bottle openers end up, they’ll get the job done. That is especially true about this model by Belle Vous. This next one from Bruntmor is a curious thing. Rather than just being the little bottle opener widget that most of these products are, you also get a piece of rubberwood hardwood. It’s been elegantly finished with a hand-painted lacquer that gives it water resistance. It’s hardly discreet and it has a strong magnet toward the bottom of the wooden piece. It is worth noting that Bruntmor state that it should hold 50 caps at a time. Judging by the rave reviews it’s received, it’s as good as they say. It’ll clearly look great on your fridge. 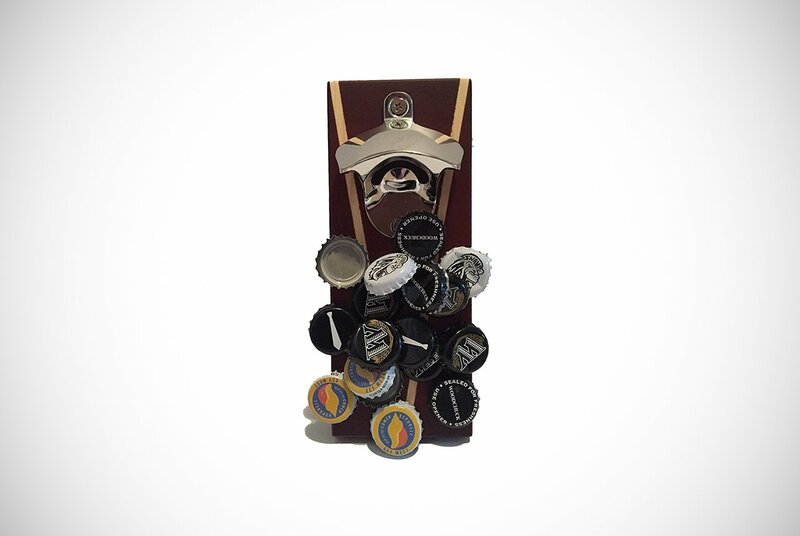 The second Magcap item on our list is this awesome magnetic bottle opener and cap catcher set. 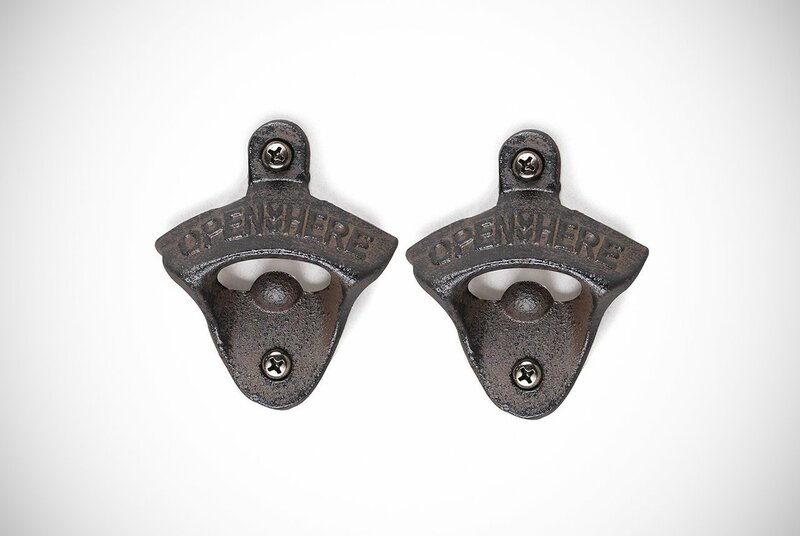 Wall mounted bottle openers like these look great in a matte nickel finish. 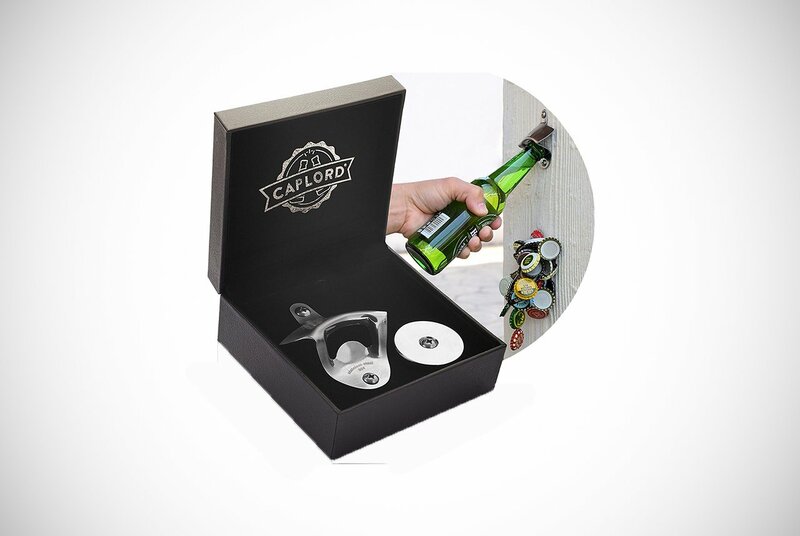 However, it covers all bases when it comes to bottle opening and cap collecting. The bottle opener has two hidden neodymium magnets to catch a couple of bottle caps at a time. Then, when it’s getting a little crowded, you can knock them directly into the tough and robust cap catching bin below. This set will wow your friends and guests. Unlike many of the others on this list, having the cap catcher below helps for those times when the magnet doesn’t work perhaps as well as it should. How about a set of wall mounted bottle openers that look like it’s lived a life and seen a few things? 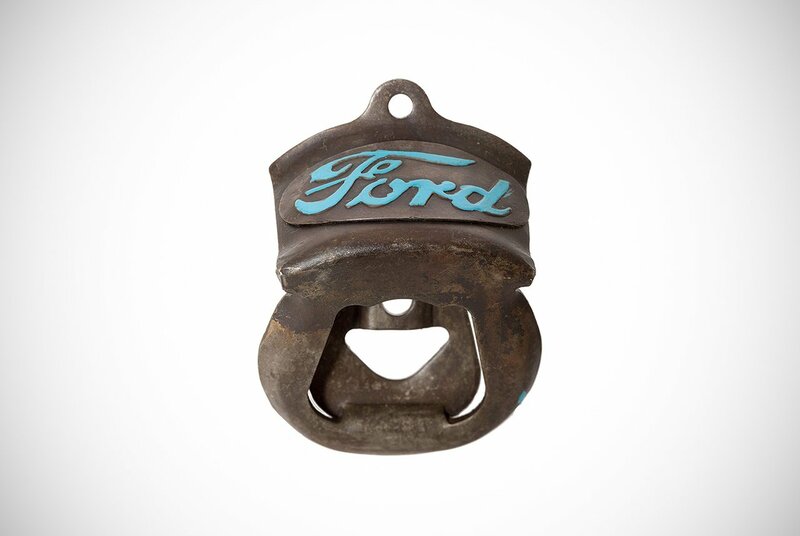 Sure, you may not want the wear and tear that goes with a bottle opener that’s been through the wars. However, you may still want that look of one that has. That’s where the Twine Rustic Farmhouse wall-mountable bottle opener is ideal. The cast iron is coated with a faux rusted iron finish to give it that used and aged appeal. Ideal for a garage or country kitchen setting or that makeshift bar you intend on having for parties. We don’t think any of your guests will be able to resist touching to see if it’s genuine or not. 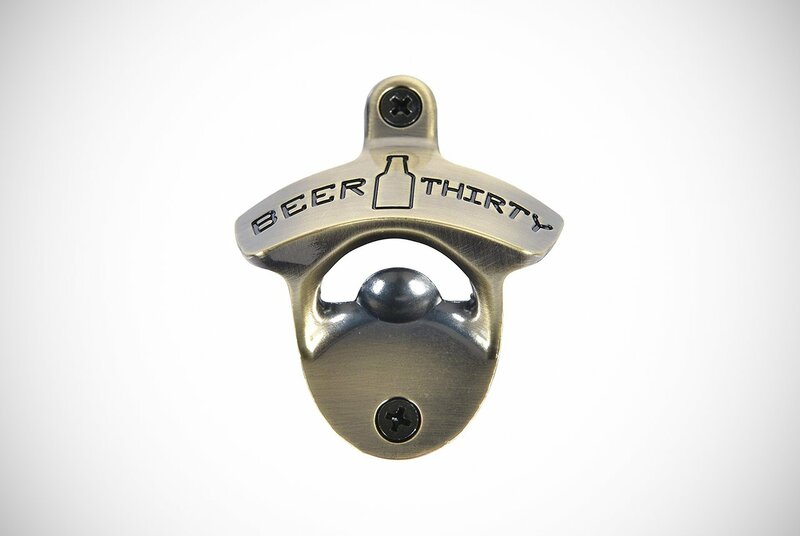 These Beer Thirty Wall Mounted Bottle Openers from Barware Gear are a no-frills, attractive accessory. It’s obvious that it will look great at your home just about anywhere. Particularly with that attractive brass finish. Comes with the stainless-steel screws you need for mounting and means you never need to look through your drawers in a blind panic again. Simply hook, pull and then drink. Not the most audacious, we have to admit. However, when it gets the job completed effectively and consistently, who are we to argue with it? Thinking that some of these are a little on the small side? Looking for something that’s going to make more of an impact, while being practical too? Vintage wooden wall mounted bottle openers with cap catcher from Inart, just like these, could be just what you’re after. The vintage wood look gives it an old-world appeal while the handy cap catcher at the bottom has a cast iron mesh wiring at the front so you can see when it needs to be emptied. It’s also kinda cool to sit back and look at the lovely array of colors and designs of different bottle caps. The only issue is that it may be worth investing in some strong stainless-steel screws to affix to the wall properly. This is due to the hook you get not being strong enough. 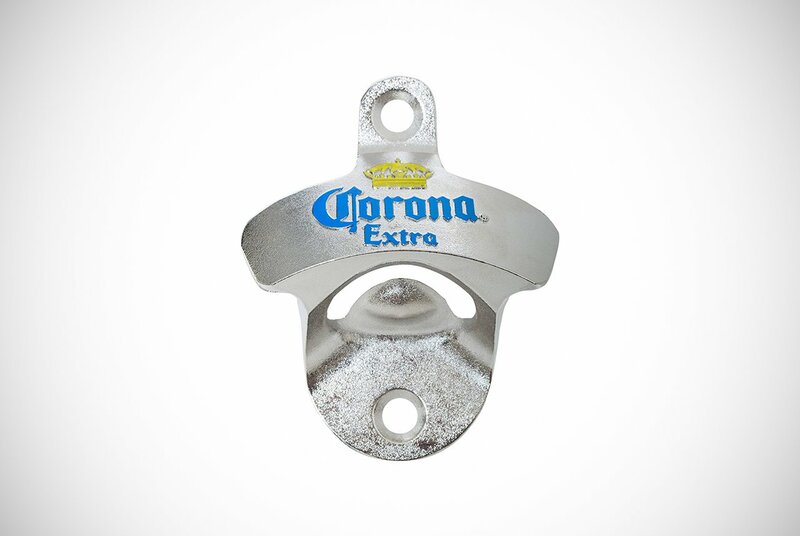 Celebrate your love for a crisp cool Corona Extra while having an awesome solution to those handheld bottle openers that keep going missing. The logo and Corona colors are something that we all know and love. That said, this is definitely going to get tongues wagging when your friends and relatives stop by for a few drinks. The rumors that this bottle opener improves your Spanish “probablemente han sido sobre-exagerado” (or, have probably been over-exaggerated). For a very reasonable price, this office piece of merchandise will ensure you are never “up the creek” without a paddle. Especially, when you need to open a beer. Excelente! How about drinking like an ancient god? Sure, Titan wall mounted bottle openers might not give you divine powers. 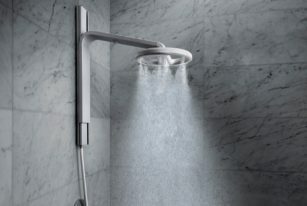 However, it will look cool wherever you install it. With a pine-oak wood backing, the sturdy and tough bottle opener is as elegant as it is practical. Although you can’t see it from the picture, around 40% of the backing contains a powerful magnet. That ensures that no caps fall to the ground. If you’ve used a magnetic catcher before and had an unsatisfying experience, this will definitely put a smile on your face. If what we’ve covered so far are not enough to appeal to your red-blooded masculinity, this next item will definitely attract the beast within. 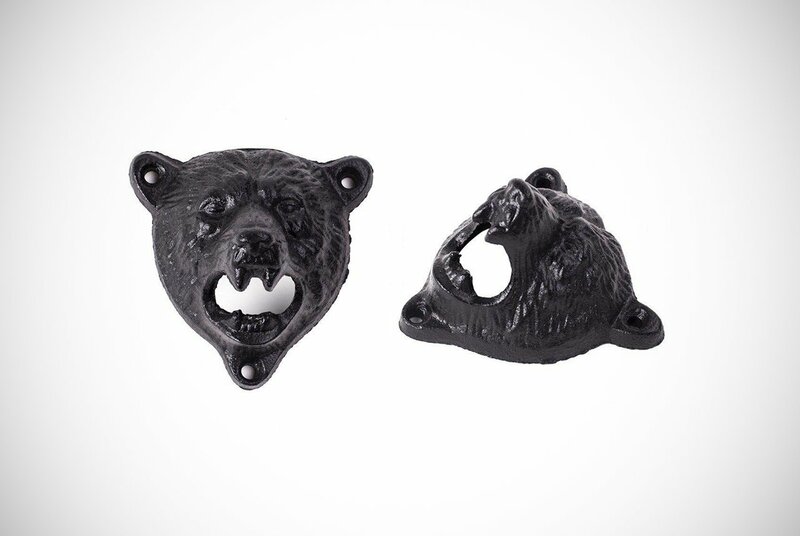 Made from sturdy and reliable cast iron, these wall mounted bottle openers resembles the face of a grizzly bear. It is looking furiously out at you as if he’s about to make you lunch. Oh, but wait, he doesn’t want to eat you. No, he just wants to help you get to that sweet nectar in your bottle by offering his teeth. Aside from the obvious aesthetic treat that this bottle opener is, it’s incredibly practical too. 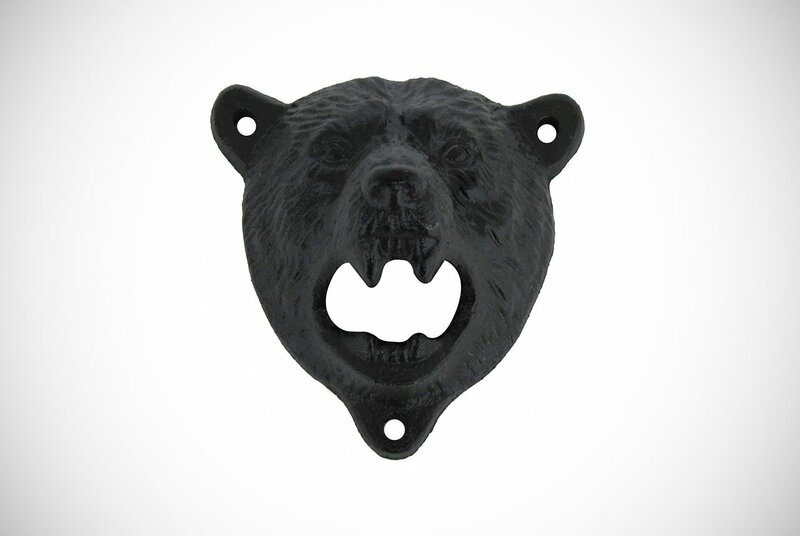 If you’re prone to losing bottle openers, we don’t imagine you’ll ever lose old grizzly! Maybe you’re not into bears but have a particular brand you really like. With the next wall mounted bottle openers, you can share your love of that brand with the choice of a die-cast metal design. Included in this is the emblem of either Pepsi Cola, Chevrolet, Ford, or Budweiser emblazoned on it. 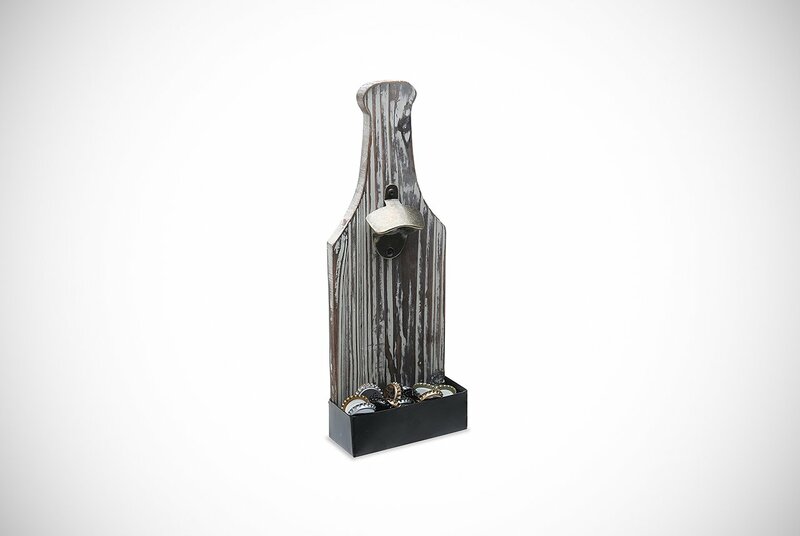 The model is made with a die-cast metal and completed with an antique finish to give it an aged and old charm. This is a great talking point and practical accessory for anywhere around the house. 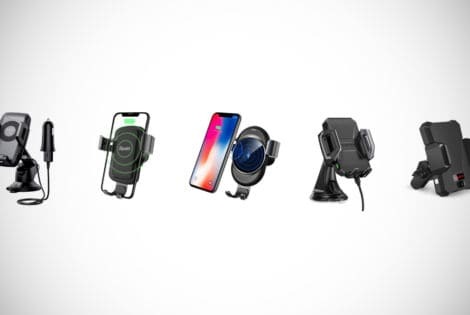 All the mounting hardware is included in the purchase price. If you entertain lots of guests at once, why not buy more than one to show your love for the different brands? Very cool and well-priced. Maybe you’re a fan of Ireland’s best-known export? Ah Guinness, with its frothy white head with beautiful black and appealing bitter taste. Now you can celebrate that love with the world and enjoy the eye-catching logo and colorings of Guinness. 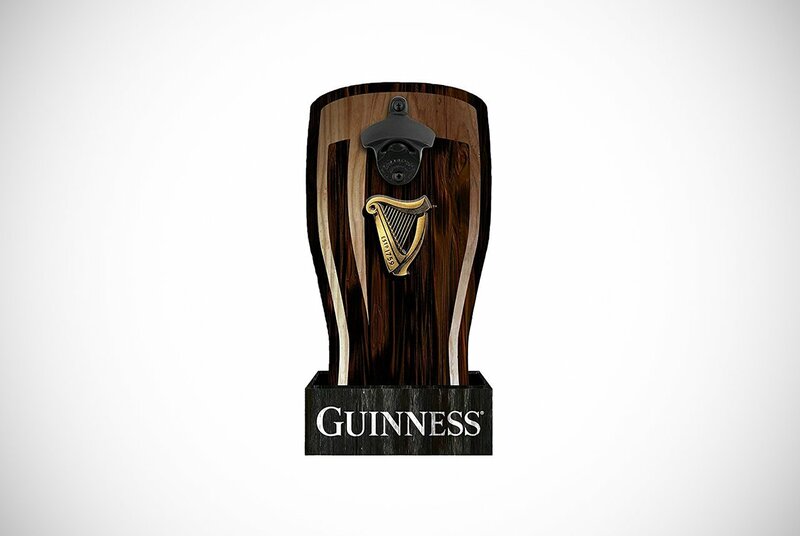 All from the comfort of your own home, with this official Guinness bottle opener and cap catcher. Resembling a pint of the good stuff, this has the harp emblem directly below the bottle opener component. It has the name along the outside of the cap catcher at the bottom. The brand already has very classy and sophisticated colors. Clearly, it makes sense that this will bring a touch of Irish charm to your kitchen, man-cave, a makeshift bar, or even garage. Do you consider yourself to be a champion of local beer? Why not help further the cause you feel so passionately about by investing in one of these wall mounted bottle openers from MudPie? 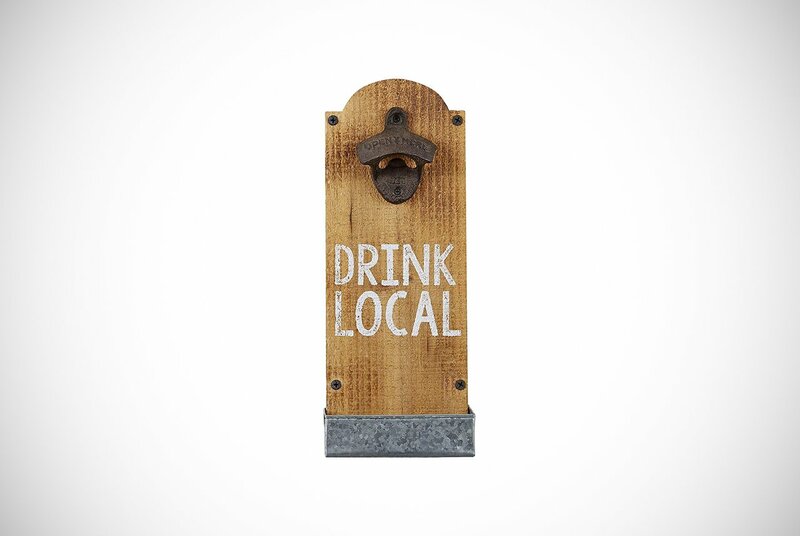 It has the words Drink Local written on it and the galvanized metal bottle opener sits against a mango wood base. The galvanized metal gives it a vintage aged look without the wear and tear to go along with it. On top of this, there’s a small metal cap catcher at the bottom. Well shiver me timbers, this is what all true pirates need. Especially when they have all those bottles of ale to drink. Maybe you’ve been watching a lot of Black Sails recently, or find yourself siding with Captain Hook. 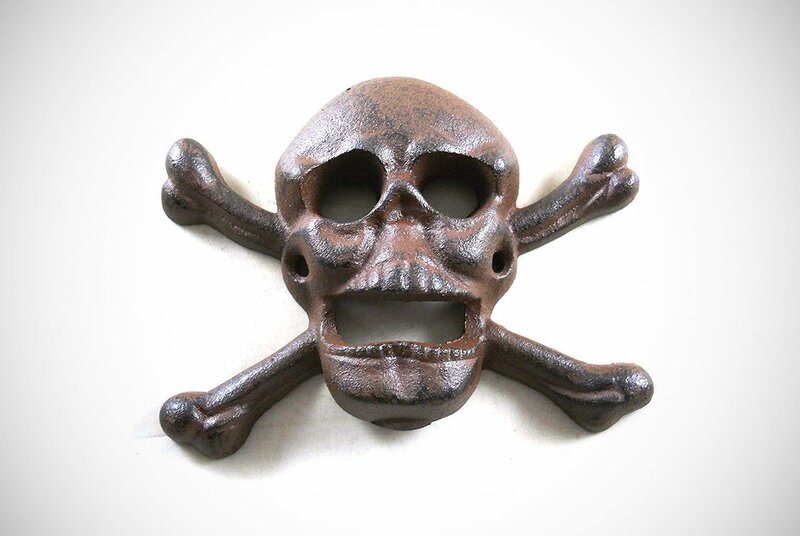 If so, perhaps you need this GSM Skull & Crossbones bottle opener. Made from cast iron and finished with a rustic brown coloring, it looks as it’s been on more than one voyage. The major downside to this is that the screws needed to mount it are not included. However, at the price its retailing, we think it’s some fine booty! If you thought it was safe to come out of hiding from the last bear we looked at, think again! QLL have their own addition to the bear beer bottle opener market. It may be a very small market, but boy is it an exciting one! It is constructed using a cast iron set in a mold with lots of texture. This gives the bear’s fur and details a real authentic look. You may find that there are more beers for you if only the brave dare to open their bottles. On a serious note, you do get all the mounting hardware for this awesome creation and it’s relatively simple to install. 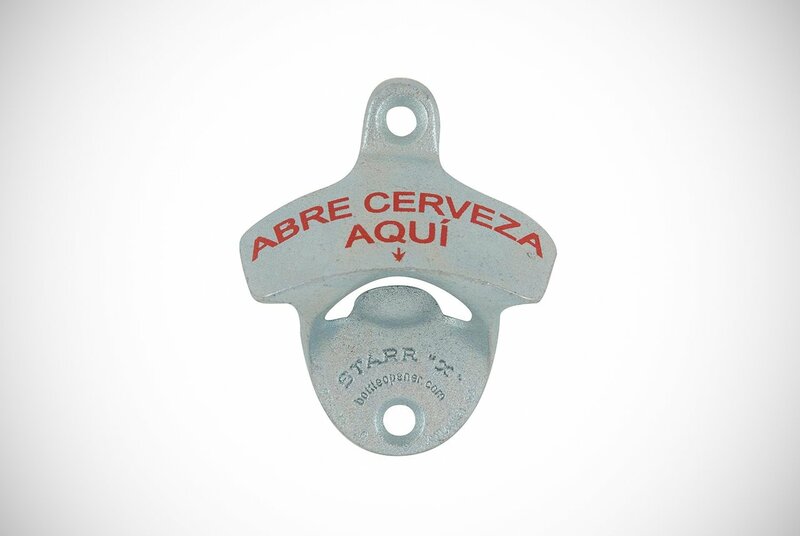 Star X made some wall mounted bottle openers that even come with Spanish instructions. That’s pretty compelling, eh? “Abre Cerveza Aqui” means Open Beer Here. You don’t need to be told twice once you know what it means, do you? We’re sure your friends, relatives, and guests will also agree. It’s been expertly crafted from a zinc-plated cast iron. That means it is durable and robust enough to last you a while. The mounting screws are attached and the price is a little under the low $10. We think all Cerveza lovers will have trouble not clicking buy on this one. The funny side of things may wear thin after a while. However, you’ll always be able to open your beer! Would you like to teach the world to sing? Do you think nothing tastes better than the real thing? 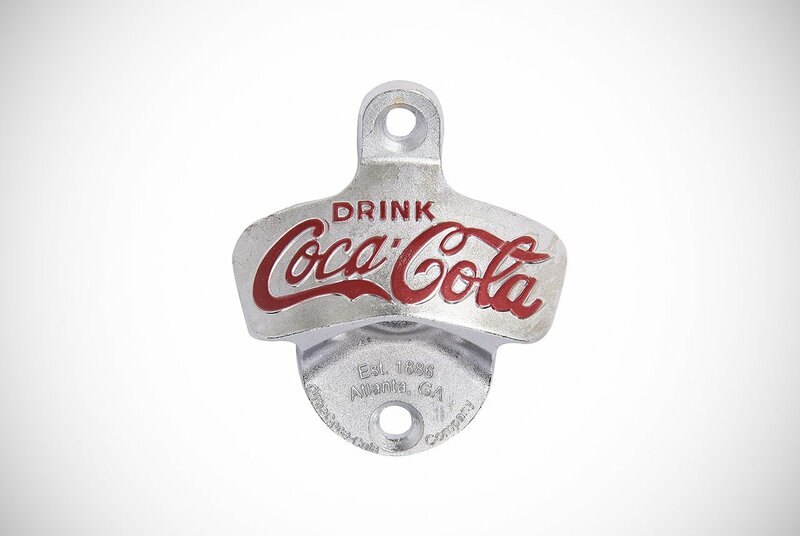 You’ll probably find a lot of joy in the TableCraft Coca-Cola wall mounted bottle openers then. Glass bottles always tasted better than the plastic alternatives. If you’re fortunate to get your hands on a crate or two, this is the perfect accompaniment for opening them. Made from die-cast and plated with a chrome metal finish, this bottle opener features the nostalgia-laden CC in all its red glory. There’s not much else to say, other than it’s a cool tribute to a fantastic brand and delicious drink. Our penultimate wall mounted bottle openers are these small models from AlcohoLux. Don’t let the little guy’s diminutive looks deceive you though because it can. According to the manufacturer, it can catch a total of 40 caps thanks to the magnetized catcher. This is definitely one for dudes that have a more “refined” taste. 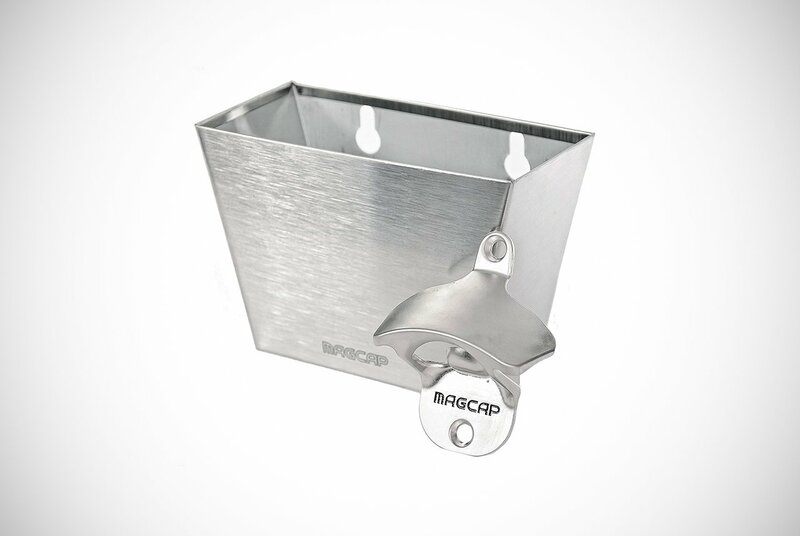 If you love those craft beers, give the cap a perfect end to its story by using this to open it. The backing is made from smart wood and a black finish. To top it off, the opener is made from reliably strong stainless steel. For the last one on our list, it’s fitting that these wall mounted bottle openers from MyGift are in the shape of a bottle. Why didn’t anyone else think of that? A unique piece of whitewashed wood has been carved expertly into this bottle shape. It features a brushed brass opener and metallic catcher. All with a black powder-coated finish. We think this has a very appealing look. However, it does appear quite simple. Though it might be, sometimes the simplest ideas are actually the best in the long run. Like us all, if you’re are looking for the best answer to the age-old ‘Where’s the bottle opener…I know I left it here’ problem, take your pick from the above selection. We didn’t make this list lightly. The ones you see before you are what we felt were the best of the best. You only get the best recommendations here at Men’s Gear. We definitely know which are getting added to our wish list! 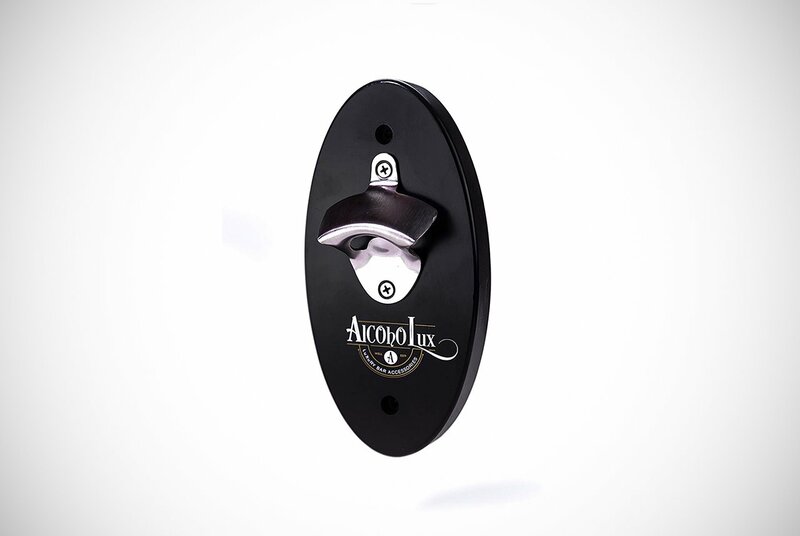 Wall mounted bottle openers are a great way to never be caught short without an opener again. You’ll never lose it as it’ll always be where you left it – attached to the wall. There’s even room for some creativity and to add a touch of personality to your home with one. If you want a scary but surprisingly helpful bear to help open your beer, you’ve got it. Maybe you wish to gaze in wonder and awe at the Guinness harp. We have just the suggestion. Ultimately, it is up to you which of the bottle openers you buy. However, we are sure the ones above will be beloved by all who buy them. The Instant Pot Ace has 4 hot and 4 cold blending programs to cook and blend food, respectively. 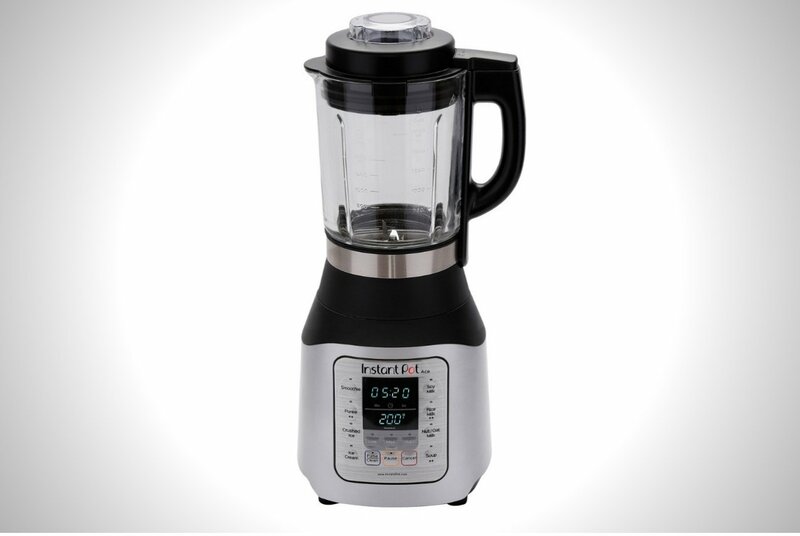 It uses advanced microprocessor technology to whip up food.